The C.E.P.M. unites professional and interprofessional organisations by their respective missions, in their respective countries, to represent and defend the interests of all or part of maize chains: corn, maize silage, maize seed and sweet corn. In this framework its mission is to be vigilant and attentive, lobbying, to inform & communicate, as well as to present proposals. Punctual and targeted support is provided alongside other C.E.P.M. members. The C.E.P.M. 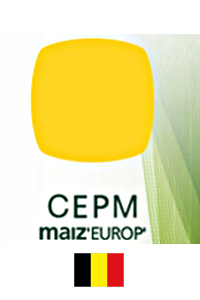 intervenes, alone or in conjunction with the COPA-COGECA (Representative organisations of the European Agricultural Union and Cooperatives) towards the institutions, notably the European Commission, in particular concerning those files relative to the maize economics management and its means of production. International negotiations within the WTO, Common Agricultural Policy and the European Budget, follow the market and its prices, new and developing applications & biofuels, Phytosanitary protection, Biotechnologies & GMO, irrigation… are the primary issues of the C.E.P.M. 10 member countries: Bulgaria, France, Germany, Hungary, Italy, Poland, Portugal, Romania, Slovakia and Spain. C.E.P.M. members produce almost all of the European maize, which represents almost all 15 million hectares of the 28 EU member States: 91% Corn – 80% Maize Silage – 92% Maize Seed – 100% Sweet Corn cultivated in the 28-EU area.